Tyler Raj Barriss, a 25-year-old serial “swatter” whose phony emergency call to Kansas police last month triggered a fatal shooting, has been charged with involuntary manslaughter and faces up to eleven years in prison. Barriss’s online alias — “SWAuTistic” — is a nod to a dangerous hoax known as “swatting,” in which the perpetrator spoofs a call about a hostage situation or other violent crime in progress in the hopes of tricking police into responding at a particular address with potentially deadly force. Barriss was arrested in Los Angeles this month for alerting authorities in Kansas to a fake hostage situation at an address in Wichita, Kansas on Dec. 28, 2017. Police responding to the alert surrounded the home at the address Barriss provided and shot 28-year old Andrew Finch as he emerged from the doorway of his mother’s home. Finch, a father of two, was unarmed, and died shortly after being shot by police. The officer who fired the fatal shot that killed Finch has been identified as a seven-year veteran with the Wichita department. He has been placed on administrative leave pending an internal investigation. Following his arrest, Barriss was extradited to a Wichita jail, where he had his first court appearance via video on Friday. The Los Angeles Times reports that Barriss was charged with involuntary manslaughter and could face up to 11 years and three months in prison if convicted. The moment that police in Kansas fired a single shot that killed Andrew Finch (in doorway of his mother’s home). Barriss also was charged with making a false alarm — a felony offense in Kansas. His bond was set at $500,000. Sedgwick County District Attorney Marc Bennett told the The LA Times Barriss made the fake emergency call at the urging of several other individuals, and that authorities have identified other “potential suspects” that may also face criminal charges. Barriss sought an interview with KrebsOnSecurity on Dec. 29, just hours after his hoax turned tragic. In that interview, Barriss said he routinely called in bomb threats and fake hostage situations across the country in exchange for money, and that he began doing it after his own home was swatted. Barriss told KrebsOnSecurity that he felt bad about the incident, but that it wasn’t he who pulled the trigger. He also enthused about the rush that he got from evading police. “Bomb threats are more fun and cooler than swats in my opinion and I should have just stuck to that,” he wrote in an instant message conversation with this author. The Wichita Eagle reports that Barriss also has been charged in Calgary, Canada with public mischief, fraud and mischief for allegedly making a similar swatting call to authorities there. However, no one was hurt or killed in that incident. Barriss was convicted in 2016 for calling in a bomb threat to an ABC affiliate in Los Angeles. He was sentenced to two years in prison for that stunt, but was released in January 2017. Using his SWAuTistic alias, Barriss claimed credit for more than a hundred fake calls to authorities across the nation. 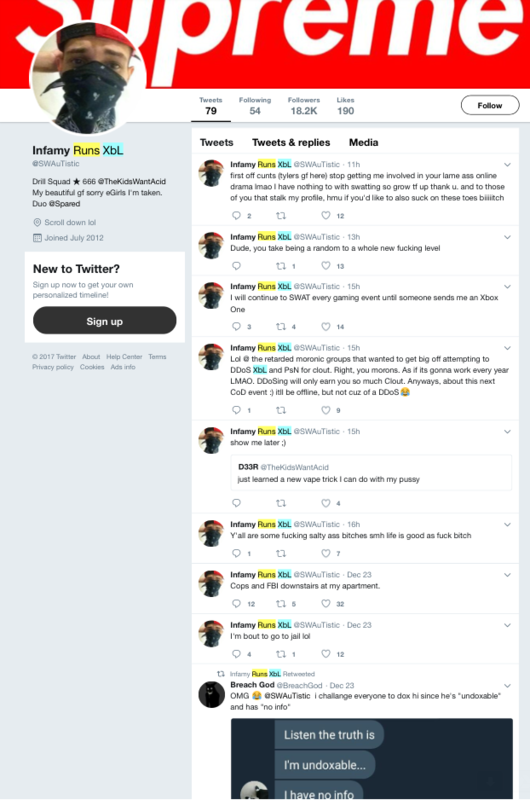 In an exclusive story published here on Jan. 2, KrebsOnSecurity dissected several months’ worth of tweets from SWAuTistic’s account before those messages were deleted. In those tweets, SWAuTistic claimed responsibility for calling in bogus hostage situations and bomb threats at roughly 100 schools and at least 10 residences. In his public tweets, SWAuTistic claimed credit for bomb threats against a convention center in Dallas and a high school in Florida, as well as an incident that disrupted a much-watched meeting at the U.S. Federal Communications Commission (FCC) in November. But in private online messages shared by his online friends and acquaintances SWAuTistic can be seen bragging about his escapades, claiming to have called in fake emergencies at approximately 100 schools and 10 homes. The serial swatter known as “SWAuTistic” claimed in private conversations to have carried out swattings or bomb threats against 100 schools and 10 homes. This entry was posted on Monday, January 15th, 2018 at 8:41 pm	and is filed under Ne’er-Do-Well News.